Adi's Art Pro Paint Brushes Set!! Check This Out!! Adi’s Art Pro Paint Brushes Set!! Check This Out!! A COMPREHENSIVE ART PAINT BRUSH SET THAT WILL COVER ALL YOUR NEEDS: Adi's art pro 10-piece art paint brushes set comes with (2) angle brushes, (2) flat paint brush sizes, (3) filbert paint brushes, (2) round paint brush sizes, and (1) rigger. SUPER VERSATILITY, USE THEM WITH ALMOST ANY KIND OF PAINT: Either a professional or a beginner, you will absolutely adore our brush kit. 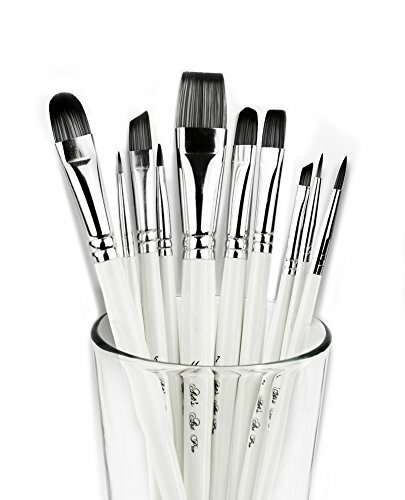 It is the ideal set to use with acrylics, face and body paints, watercolors, gouache, or oil paints. A QUALITY SET THAT WILL LAST FOR YEARS: Features non-shedding hand-picked synthetic bristles of the finest quality, rust resistant aluminum oxide ferrules, and genuine birch wood handles.